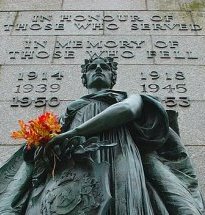 Canadian Battlefield Tours (CBT) strongly believes that your Liberation of Holland tour should be much more than a ceremonial tour, comprised almost exclusively of parades and ceremonial visits to cemeteries. We believe your tour should reflect the reality of the tragic events that led to the loss of so many young Canadian lives, now resting peacefully in the beautiful Holten Canadian War cemetery. You should follow the routes to the battlefields where the majority of these 1,394 heroes lost their lives and see for yourself, the tragically high cost of the Liberation of Holland. Of course, there would not have been liberation for the Dutch, without the horrible battles that had to be fought in Germany first. These battles resulted in the deaths of 2,300 Canadian heroes, now resting peacefully in Groesbeek Canadian War Cemetery. For many Canadian Veterans, the Battles of the Rhine, were their worst of the war. More information on the Liberation of Holland can be found here.